Seven Days Blogs: Freyne Land: "Irresponsible Journalism"
That's what House Agriculture Committee Chairman David Zuckerman [P-Burlington], called on-air remarks by "Vermont This Week" Host Stewart Ledbetter on Friday's broadcast, remarks suggesting he had not been telling the truth in comments published in last Wednesday's "Inside Track" in Seven Days. Ledbetter [left] is a veteran reporter on WPTZ-TV, the Plattsburgh, NY-based Hearst-Argyle affiliate with a Vermont bureau in Colchester. 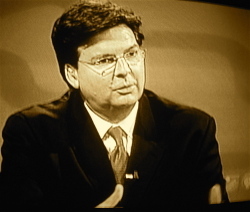 He replaced Chris Graff this year as the host of the weekly news discussion program on Vermont Public Television that airs Friday night and is repeated Sunday morning. One of this week's headlines was: Election '08: Is Anthony Pollina The Democrats’ Best Hope? "As we look ahead in the off-year to Campaign ‘08, we saw a couple of dueling blogs this week, which certainly caught our attention for their implications and what they say, sort-of, about the back-story negotiations between the Progressives and the Democrats. And the issue was whether or not the top Democrat in the state senate, Peter Shumlin, was sort of acknowledging in private conversation that maybe Progressive Anthony Pollina might be an acceptable consensus candidate between the Progressives and the Democrats to run against Jim Douglas, who Peter Shumlin would like very much to see replaced." "Or maybe the story that Shumlin was pushing Anthony Pollina is simply not true." Maybe the Moon is made of green cheese? First of all, I missed the "dueling blogs" that Stew's referring to, just comments by "odum" in the Green Mountain Daily blog last Thursday [link in column right]. More here in "The Pollina Possibility?" Informed in the park on Saturday of Mr. Ledbetter's on-air comments on "Vermont This Week," Rep. Zuckerman, at first, appeared a bit shocked. Ledbetter had not spoken to him about it. "I respect Stewart Ledbetter," said Chairman Dave, "but that's irresponsible journalism." "Absolutely, 100 percent!" Zuckerman replied. "I will stand behind that for eternity." Trust me. He meant it. Meanwhile, I still haven't had the voice messages left on Sen. Shumlin's cell-phone last Tuesday returned. If it wasn't true, don't you think Shummy would have called by now? And VTW Host Ledbetter has not, as yet, responded to my Sunday e-mail seeking comment. No need to stay tuned. Your credibility does not require confirmation from anyone. Your years of reliable, accurate report are you credentials. Further, the story has been current around the Democratic Patrty for months. I think your are entitled to an apology. Let's get something straight. You don't have to be a Progressive to know that Zuckerman is an honest guy and Pete Shumlin is a dishonest crook. John Odum took Shumlin at his word, and that's just naive. Enough said. Cool! We're dueling! High drama! Who knew? To be clear, it is Vt. This Week that I feel should apologize. Odum simple quoted a perhaps self-serving source. Ledbetter drew an unwarranted conclusion about another person's conduct as a journalist. Just curious - what benefit does Farmer Dave realize by spilling the beans of an internal Prog-Dem conversation to Peter Freyne other than publicity for himself? Surely his whistle-blowing will annoy Dem leaders who wanted the courtship kept quiet for the time being. He also may have cost the Progs a chance at the governorship, if all the recent talk is enough to make Shumlin (and others?) decide not to support a Pollina candidacy. I think Farmer Dave plays politics first and foremost (which is not a statement on his level of honesty per say, but on his motives). Zuckerman seems to be pretty sensitive for a politican. I didn't see the show, but if Ledbetter simply questioned whether or not the Shummy story was true then Zuckerman shouldn't have been upset. Jeez, Shamlin has used Simpleton as a pawn all last session, what makes Suckerman think he didn't get conned by Shamlin too. Back in '02 VPR was interviewing Shumlin who was trailing in his race for LG. He said he was confident because he had a list of Southern Vermont towns in his shirt pocket that would be the difference. When the reporter asked to see the list, Shumlin said he must have given it to an aide. I'd never call him a dishonest crook as the writer did above. He's just misunderstood.